Max McGee will appear at the Stockbridge Theatre tonight. Catch him before he disappears. DERRY -- They call him Magic Max. It’s a nickname that 17-year-old Max McGee of Derry has embraced with some reservations. “It sounds a little childish, I think,” said McGee, a Pinkerton Academy senior. Because if there’s one thing McGee is not, it’s immature when it comes to magic. McGee, who is never without a deck of cards, was first introduced to magic when he was 7 years old by his doctor as a way to manage hyperactivity and anxiety, he said. Since then, McGee has continued following his passion with private shows for friends and family and impromptu performances in school. At 16, he began work as a contracted street per­former at Canobie Lake Park in Salem. He has also recently signed on with an entertainment company to begin working private functions. But on Thursday, McGee will take his “street magic” to the stage for the first time in a Vegas-style magic and variety show he has put together himself. The show begins at 6 p.m. at the Stockbridge Theater at Pinkerton Academy, combining McGee’s original tricks with the musical and dance talents of several classmates. Tickets are available at the door for $5, benefiting Pinkerton’s DECA club, an association of marketing students to which McGee belongs. McGee’s show features all-new tricks he has created specifically for the Stockbridge stage, including one act where he vanishes and reappears across the theater. But McGee said his signature is close-up magic with a simple deck of cards. When putting together tricks, McGee said he starts with a seemingly impossible act — like making a card appear in someone else’s pocket — and then challenges himself to find a way to do it. 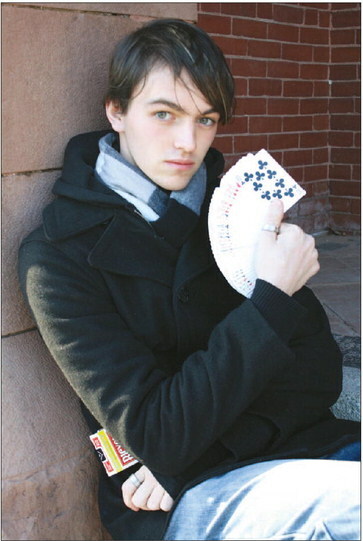 But McGee says he doesn’t turn to other magicians for inspiration. “It will be like Blue Man Group plus David Copperfield and Cirque de Soleil all in one,” he said. He plans to start college next year to pursue a degree in entrepreneurship, which he says will help him with the business side of a career in magic. And when McGee steps onto the stage for the first time Thursday night, he says he hopes he never leaves.